A few weeks ago, a potential client reached out to me asking for help with e-decorating her living room. She had moved into her dream home in April, and with it came a gorgeous living room with beautiful molding, hardwood floors, an open floor plan, and a built-in entertainment wall. She didn't know where to start, and I was more than happy to collaborate with her to create her dream living room. She wanted the room to have a cozy Mediterranean/Tuscan feel, but also wanted to maintain certain individual design elements, including the wall color (a light, neutral tan) and the built-in entertainment wall finish (walnut/mahogany stain). She also wanted to keep the existing sofa, loveseat, and light fixtures. Keeping this in mind, I decided to keep a neutral palette for all of the furniture. This allowed me to add some pattern and color through the accessories. Because her built-in entertainment wall is a walnut/mahogany finish, I thought all-white accessories would really pop against the stain of the entertainment wall and modernize it a bit. 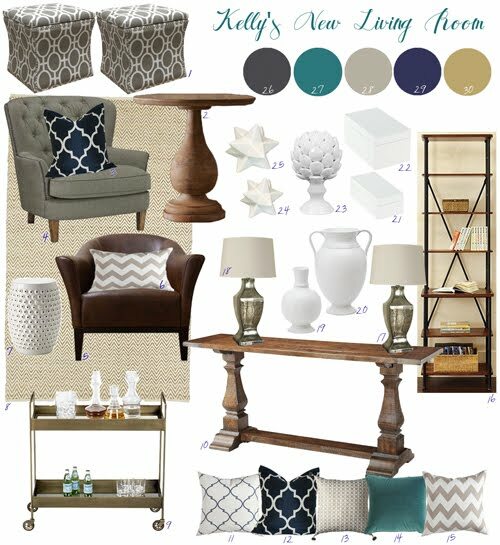 Kelly, my client, absolutely loved the final design board and I am so thrilled to be sharing this with you. It's one of my favorite design boards, so I had to share it with you all. Thank you Kelly for being such a wonderful client and allowing me to share this with my readers! If you have a room that needs some TLC and you would like the perfect design board (along with a source list and furniture placement plan) created for your space, then please check out my E-Decorating services! إن زيت الأطفال ليس فقط لتنعيم وتنعيم البشرة - إنه في الواقع مزاج لرفع الشحوم أيضًا. إذا كان غطاء جهاز الطهي الخاص بك ، أو غيره من الأجهزة المصنوعة من الفولاذ المقاوم للصدأ ، غليظًا بعلامات الإصبع ، ضع كمية صغيرة من زيت الأطفال على قطعة قماش نظيفة وألياف دقيقة وقم بمسحها.